The summer of 2001 my Mother in very good good health and physically active(77 years old)became ill with pnuemonia. Was treated with inhalers and antibiotics. Didn't go away so was treated with Levaquin. The first week she became very ill, the skin on her arms turned to what she called alligator skin. Waiting for the car her arms broke out in a terrible rash and have since become very sensitive especially to sun. They bruise and bleed at the slightest bump The skin is so thin it is like onion skin. Also she developed a yeast infection that was so terrible that the doctor had to drain a spot that was inside her. I remember the pharmaceist saying after hearing all that happened on the outside of her body that he wondered what went on inside that couldn't be seen. Within a year she was diabetic. She was a little over weight but always a walker and caregiver for my father so very active. Neither of her parents were treated for sugar problem .I always wondered if the side effects could have caused some major changes for her? I just know that she didn't take but a week of it and Thank God.She was so sick. Sorry to hear about your mother. That's never fun. The sensitivity to sunlight is a very common antibiotic reaction. So are yeast infections, since antibiotics kill the good which allows the bad to flourish. And I hate to say it, but your mother wasn't in good good health. She may have looked healthy, but that doesn't mean the system is operating optimally. If she got pneumonia, she wasn't as healthy as she looked. and the decades of poor nutritional intake that most of America suffers from. You don't mention many of the common Levaquin Tendonitis symptoms, like muscle and tendon pain. But Levaquin side effects can look like a lot of different things. It's also quite possible that the Levaquin shocked her immune system and she's never recovered. Said another way, Levaquin is an insult to the body in a variety of ways, and if it knocks the body down far enough, the body can have a hard time recovering. Your mother at 77 years of age has enough problems with her body/system, and generally healing and recovery is MUCH slower the older we get. For good reasons, some of which are avoidable, some aren't. So yes, Levaquin could have caused some major changes for her. The diabetes, though, is most likely purely a function of diet. Both my wife and I had Pneumonia. We were both given Levaquin and at about the 5th or 6th day, my wife had rotator cuff pain in both shoulders. I had pain in my right shoulder and in my left Achilles tendon. I can hardly walk to the Doctor for any help. My wife can walk since her achilles area wasn't affected. I've heard that Magnesium can help and I'm taking 250MG twice daily of the Chelated form. Just started that two days ago, so too soon to tell if this helps. I'm also taking B-2,B-6 and B-12 plus about 1,000MG of Ascorbate C.
I'm concerned that although I'm resting the leg, that the tendon can rupture as I've heard from other Levaquin Tendonitis cases. I'll like to get a Sonogram of the ankle and calf area to see just how much damage there is, but can't walk well enough to get there. Can painful walking while I have this condition cause a complete rupture of the Achilles? Right now, I walk around my house very slowly with cushioned slippers on carpeted floors. That for the most part causes no pain at all. My question to you Joshua is, what should I avoid and what functions will help? Can you suggest any other supplements other than the ones I mentioned above? Its been only about two weeks since we first got tendonitis so there should be much room for improvement. I believe that Levaquin tendonitis is like a poisoning of the connective tissues and tendons in the body, and therefore is more like a chemical form of tendon damage. With mechanical tendon problems, stretching and physical therapy can help. But I don't think in our case that would be appropriate. Am I correct in saying that? Joshua, any and all replies will be greatly appreciated. 1. How much Levaquin did you each take? 2. "Can painful walking while I have this condition cause a complete rupture of the Achilles? " Yes and no. It's not really the walking, it's the damage to the structural integrity of the tendon/connective tissue from the Levaquin mechanism. Basically, if the tendon is going to fall apart, the damage has, for the most part, already been done. Point being, it's not the activity, it's your body's response to the Levaquin doing it's thing. Don't push it, obviously, as rupturing is worse than sticking together, but the focus is all wrong if you're looking at activity as a cause of tendon rupture post-Levaquin. Along those lines, rest doesn't help...due to what Levaquin does to the body. 3. More Magnesium. As much as you can get into and onto you. There's a lot I could say about nutrition other than what you mentioned, and more about what you did mention. Too much/too involved for here though. That's why The Levaquin Tendonitis Solution. It doesn't serve you very well to drop out a little bit here and there (having said that, 'more magnesium' is very valuable and worthwhile). 4. "and therefore is more like a chemical form of tendon damage. " Essentially, yes. Stretching and strengthening will help fix a Levaquin dynamic exactly 0%. So yes, you are 100% correct. We both took 500mg once daily for ten days. But after eight days, we stopped as we both had strange muscle pains. I guess, 8 days, 10 days it doesn't matter much that we stopped two days early. OR?? Did those two days less save us from extreme damage? BTW, neither of us are 77 yr .old. We are over 60, as in the warning on Levaquin 60 or over are much prone to tendonitis. Any other help you can give us? "Did those two days less save us from extreme damage?" There's no real way to tell. But it's safe to say, less is better. Can eccentric exercises help Levaquin tendonitis? Levaquin Tendonitis is NOT regular tendonitis. Eccentric Heel Drops can help regular Achilles Tendonitis. 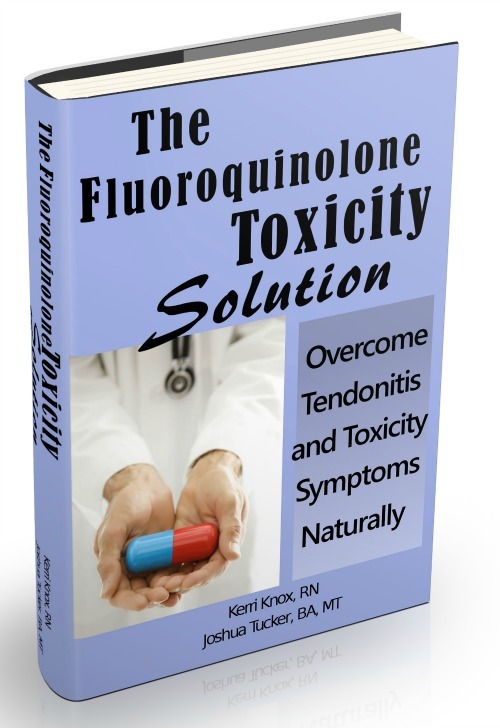 But Levaquin side effects are from the cytotoxic mechaninism of the fluoroquinolone. It's more of a chemical induced damage. But even then, the 'damage' (if there is any damage..doesn't have to be even if there is severe pain) isn't really the problem. The problem is the CAUSES of the damage, and those are still in place long after the Levaquin is out of your system. So one of the most valuable bits I can offer here is...don't think about Levaquin tendonitis like it's regular tendonitis. It's not. And that's why physical therapy, chiropractic, acupuncture, massage, yoga, meditation, ultrasound, heat/ice, etc, have zero chance of fixing a fluoroquinolone dynamic. Sure they may reduce symptoms to some degree, but they can in no way 'fix' the causes of levaquin tendonitis.